artist: Various title: Part 2: Action (Incidentally) format: Zig Zag 1/3 pg advert / Blitz 1/2 pg advert design: XLZTT photography: n/a cat. 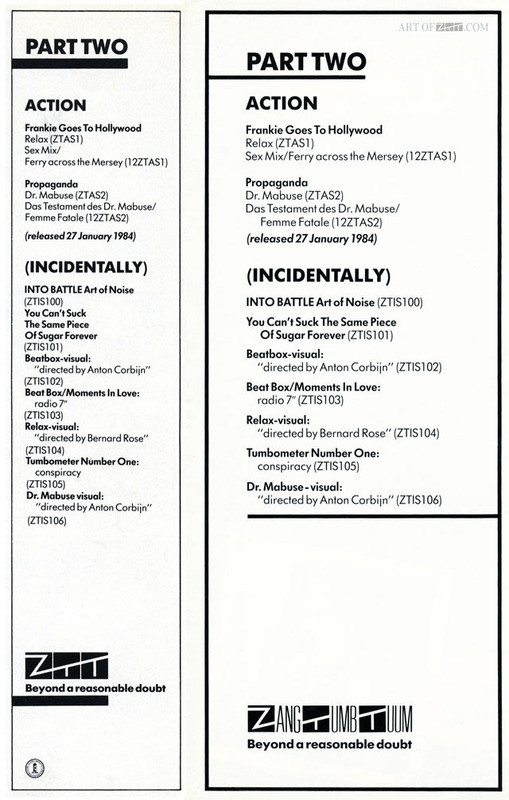 no: n/a date: 12/83 – 01/84 art of notes: These ads appeared before ‘Dr Mabuse’ was released and indicate a Jan 27th release date – press ads for that single started to appear two weeks after that and discogs quotes a Feb 27th release date so I would pitch the actual release date around mid February. Paul assigns Incidental catalogue numbers to videos, an American promo 7″ containing ‘Beatbox’ and ‘Moments In Love’ and the first Tumbometer – the name of the random ZTT newsletters. The split ZTT logo incorporating the Zang Tuum Tumb name was later used on the grey label house bags. I like the way that, even though these ads say the same thing, they are still different.